Your wedding day is almost here! Home stretch, you guys!! One of the most important details left to do is to create your photo list. WHAT IS A PHOTO LIST? 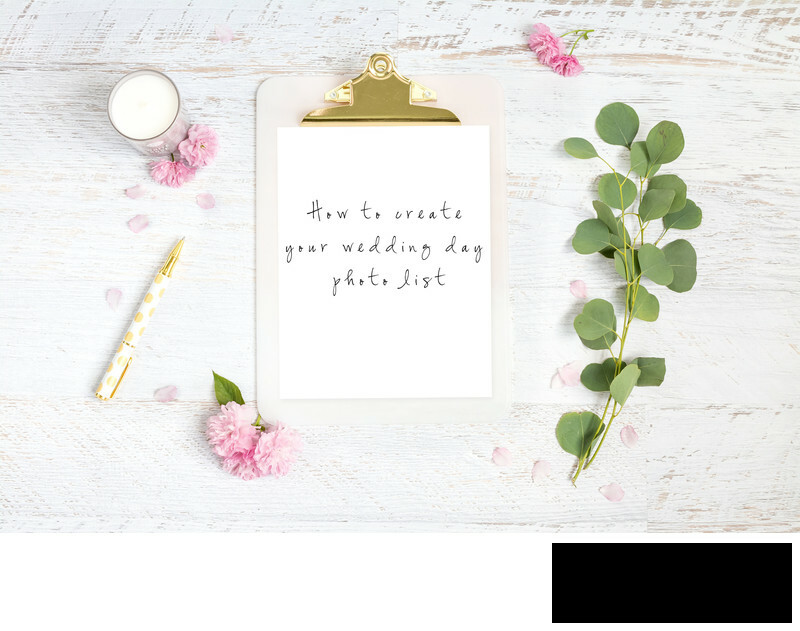 A photo list is a list of the special people who will be present on your wedding day that you would like to take a photo together with. I want to begin by very strongly encouraging you that you and your betrothed are uniquely you. Your wedding day is uniquely yours. Your wedding photos should also be uniquely yours. That being said, please please please understand that wedding blogs, pinterest, magazines, and other influences are there for inspiration, but not re-creation. That being said, a photo list is not a list of photos that you want to re-create. Who Should I Include On This List? Think about the days, months, and years following your wedding. Envision yourself revisiting your wedding album and all of the additional wedding photos. It happens to nearly every couple: "I can't believe I forgot to get a photo with ____." The best way to avoid having this happen to you is to have your guest list in front of you when you create your photo list. Begin with family members. Add any additional guests to your list as you wish. What if I want a photo of everyone? I love being a yes person. I love telling my clients that taking a portrait with everyone is no problem. Can it be done? Oh absolutely. The truth is, unfortunately, it is just not realistic - at least, not without a bit of creativity. Why? LOTS of reasons!! People need to get up to use the washroom, to have a smoke, or to call the babysitter. Tracking them down may end up being challenging or even impossible. You and yours WILL get photo exhaustion (it's a real thing, and you'll appreciate how difficult it must be to be a model after your wedding day, I guarantee it). EVERYONE will want to talk with you and your new spouse, and they will want to talk with you for as long as possible. The list goes on. • Have your DJ make an announcement after everyone has been served dinner, and take any additional portraits on the dance floor. Be sure to make this quick so that you don't delay dancing. PLEASE add to this as much as you want. This is a very loose formula that is meant to be customized. ADD ACTUAL NAMES HERE!! This is important!!! To make gathering large groups of people easier, simply call them by their last name - Jones family, the Smith Family, etc. Please remember to adjust for mixed family situations. c) Bride and groom with Sally, Jimmy, Becky and Bobby. • The groom will be dancing with his grandmother at the reception. Please capture this. I believe you get the idea from here! Simply be as complete as possible when creating your list. Having a photo list is EXTREMELY important, and should not be an afterthought. It not only ensures that you get all of the portraits that you will want, but also gives your photographer a to-do list. Remember, your photographer does not know your guests at all. Give them a guide to help them capture all of the important people who will be celebrating with you! Please also remember that while your photographer cannot guarantee that all of these requests will be possible, they will always do their absolute best to try!